Wednesday morning I went to do a load of laundry and quickly realized the load I'd put in on Monday night was still in there, having not yet made it to the dryer. That load needed to be rewashed. At that exact moment, as I was about to put another round of detergent in and start the washer, the kids yelled up the stairs that I had a package in the mail. In the package was a container of Purex Crystals Limited Edition Fabulously Fresh. Talk about perfect timing! The Purex Crystals are a laundry freshener that goes straight into the washer with the detergent. The top of the bottle is a measuring cap for perfect portion control. The in-wash fragrance boost crystals smell wonderful and sure did help with that first load of laundry, which smelled very nice and fresh when I took it out of the washer and had no residual odor. That same evening my son decided that he didn't want to hand wash the dinner dishes so he took it upon himself to remove our old dishwasher and install a new one that had arrived the day before (awesome kid!). As he unhooked the old dishwasher water gushed out onto the floor. Ian used every towel he could find to soak up the water and then, because he was really focused on the dishwasher, tossed all those towels into a pile on the lanai. Ian, amazingly, got that dishwasher hooked up by himself! I'm so proud of him. Guess what the next load of laundry to get a dose of Purex Crystals was? Yup, those towels. They came out smelling wonderfully. I've since added it to every load of laundry I've done and have been very pleased with the results. In the past when I've made homemade laundry detergent I've added a bottle of the crystals to the concoction (equal parts Borax and washing soda, with some Fells-Naptha soap shredded in) and it really adds a nice scent to the laundry soap, which is otherwise pretty unscented. I really think this Fabulously Fresh formula would be great for this, as it's meant to keep clothes smelling fresh for weeks and is safe for all loads. 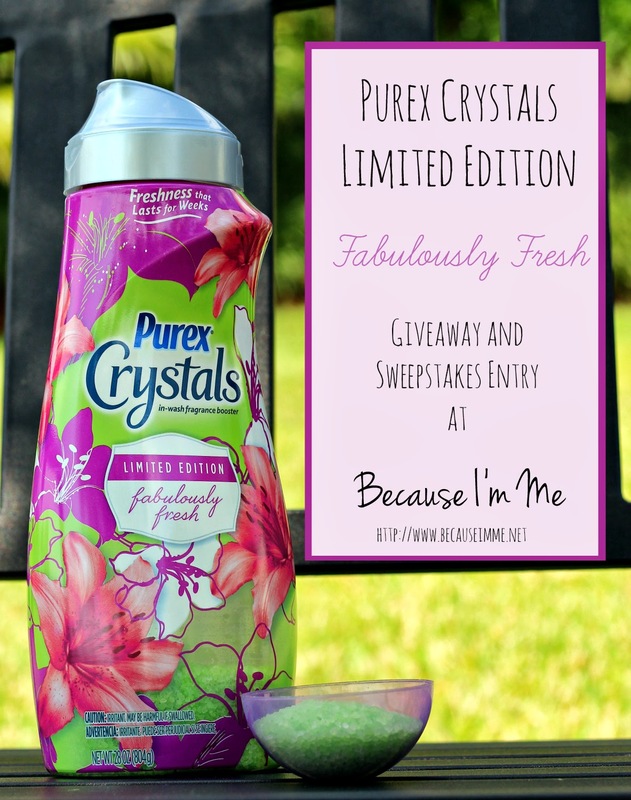 Fill out the Rafflecopter thing-a-ma-jig below for a chance to be 1 of 3 winners of a bottle of Purex Crystals Limited Edition Fabulously Fresh to try out for yourself. Also, the Bring on Spring with a Fabulously Fresh Wardrobe Sweepstakes has launched! 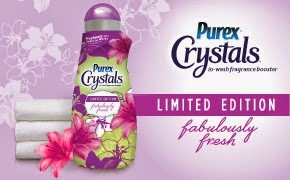 Make your laundry day fabulous with Limited Edition Purex Crystals Fabulously Fresh. 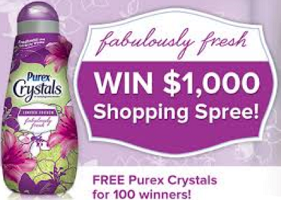 Enter for a chance to WIN a $1,000 shopping spree plus a year’s supply of Limited Edition Purex Crystals Fabulously Fresh (click here to be taken to the entry form). The Purex brand provided me with a sample of Purex Crystals Limited Edition Fabulously Fresh in exchange for a product review. However, all the opinions expressed here are my own. Purex Crystals are my favorite fabric softener. I wash daily which saves me huge loads and time! I'm I the only one who loves doing laundry?